Mongolias ancient capital, Kharakhorum, Chinggis Khaans fabled city, was founded in 1220 in the Orkhon valley, at the crossroads of the Silk Road. It was from there that the Mongol Empire governed, until Khubilai Khaan moved it to Beijing. 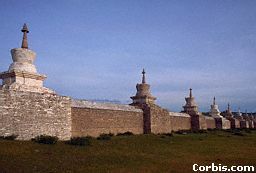 The symbolic ruins of Kharakhorum (Harhorin), monumental walls (400 m of length) with 108 stupas, surround the first Buddhist monastery in Mongolia Erdene Zuu Monastery, built in 1586. In 1792, it housed 62 temples and 10,000 lamas; since 1990, it has become an active monastery again. Turtles carved from the stone marked the boundaries of the complex. Nearby, Turkish monuments and rock inscriptions erected in 8-9th centuries in memory of outstanding fighters for independence.Travel by air, Located 370 km away from Ulaanbaatar Elevation is 1600 metres above sea level. World famous place for its wounderful relics of the past. 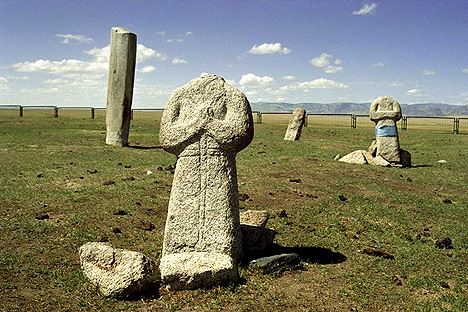 In order to get acquainted with Khujurt one has to visit the ruins of the ancient town Kara Korum, wel-known througout the world, where in the 13-th and 24-th centuries the capital of Mongolia was situated. At the time it was a busy, splendid, big city city with high culture. Those who whould like to visit Kara Korum can also see the former Buddhist monastery at Erdene-Zuu erected in the 16-th century. Quite a surprise for the scentists was the discovery of a burial of a Mongolian woman which dates to approximately the 14-th century where also two Egiptian masks, a wooden comb and a bronze mirror in a silk case wre found. The ruins of this ancient capital of Mongolia Kara Korum and the Erdene Zuu monastery with their 108 stupas are undoubtely at great interest to travellers. "Erdene Zuu Monastery is the first buddhist monastery in Mongolia. It was built at the initiative of the most influential Khalkha lord Abtai Khan, in 1586 on the spot where Kharakhorum, the famous capital of the Mongolian Empire of the 13th century was." During the Russian period, almost all of the Buddhist monasteries were destroyed and tens of thousands of monks were killed. 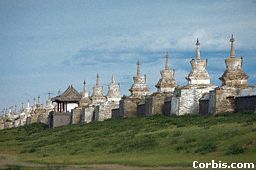 Only three monasteries survived, one of them was the largest one in Kharakhorum, Erdene Zuu Hiid. 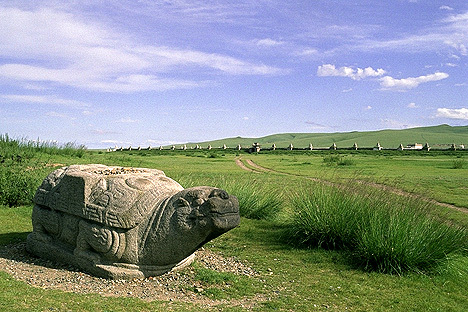 Kharakhorum (Kharkhorin) was the ancient capital of Mongolia under Genghis Khan. The monastery in Ulaan Baatar was another one that survived. Buddhism is now coming back. Mongolian Buddhism was influenced very much by Tibet. This can be seen in a lot of the older paintings in the few monasteries that were left by the Russians. There was also some influence from India in some of the paintings. On one occasion I saw a Mongolian culture show. The music is different from other countries that I have visited. One part of it is very unusual: The throat singing. It is done by men in a very high voice. It takes long training to become good in this type of singing. The acrobats are, as usual, quite impressive. Kharakhorum is located in Ovorkhangai Aimag, 360 km southwest of Ulaanbaatar. Fly to Arvaikheer, the Aimag's capital, (is 1.30 h) then reach the site by jeep, or drive by jeep from Ulaanbaatar (6/8 hours). It is suggested to stop at Bayangobi, located 280 km west of Ulaanbaatar and 80 km from KHARAKHORUM and offering a combination of mountains, forests and Gobi-type sand dunes.